Are pests giving your pets the summertime blues? Heres some tips to stop those pesky critters! How To Protect Your Pets From Summertime Pests. As summertime approaches, you likely start thinking about your own personal protection against pests. You might wear protective clothing or purchase insect repellents. It also means protecting your garden from an array of seasonal pests. But what about your pets? Summer pests can bring with them a plethora of diseases that can wreak havoc on your beloved pet. By protecting your pet from fleas, flies, ticks and mosquitoes, you can greatly reduce the risk of them contracting dangerous and even, fatal diseases. There is a lot you can do to keep your pet safe this summer. Mosquitoes are a serious problem for pets and humans alike, especially during the summer months. They are known to carry many different diseases, such as heartworm disease, depending on the species and location of the mosquito. They also pose unique threats to different types of animals. Luckily, protecting your pet from mosquito bites is not that difficult. For starters, controlling the time your pets spend outdoors during the summer will make a big difference. Mosquitoes are most active during the early dawn and then, later at dusk. Ticks are slightly harder to protect against. They may hide in trees, debris, weed, or grass and are not as easy to spot or to keep away. The best methods for protecting against ticks are all-natural sprays, tick collars, and other medications. 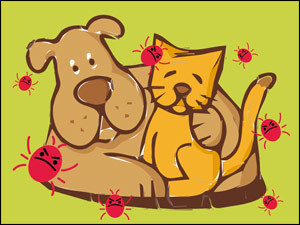 It is important to consistently check pets for any signs of ticks after coming in from outdoors. Ticks should be removed carefully and then, flushed down a toilet. You can also take a few extra steps to protect your lawn against ticks. First, keeping the grass cut short decreases the risk of encountering a tick. Remove debris such as wood, branches, or bricks. Finally, you can purchase lawn treatments that are applied to the edges of the lawn to prevent ticks from entering and breeding in the yard. Pests can become a problem indoors during the summer time, as well. Pets are often infested with fleas from outside, which they then bring inside. Getting rid of an indoor flea infestation can be extremely difficult. Preventative measures are always the best solution. Flea collars work great for small cats. They keep fleas from jumping on the cat which helps to prevent them from entering your home. For dogs, you can use a prescription flea medication. These will cause the fleas to die once they bite the dog so that they cannot reproduce indoors. Regular cleaning of the pets and the carpets will also reduce the likelihood of an indoor pest infestation. Fleas can quickly multiply and hide in carpets as well as furniture. Using a flea powder or spray and then, cleaning the carpets and furniture can stop a few fleas from becoming a few hundred fleas. Whether you are using essential oils, chemical treatments, collars, or medications, always make sure your products are labeled as safe for use with pets. You can take extra steps to research the ingredients to be certain there is no possible harm to the animals. Contributing author, Hans Seca, is a successful businessman and has been factory trained with 7 years of experience in outdoor insect and pest control. He invites you to learn more about mosquito control DIY systems, visit AutomaticMosquitoControl.com today. Have any great tips to share on pest control for pets? Sign up on Pet Talk where you can join in conversations about your cats, dogs, or any other animals… and share your stories! Photo collage images provided courtesy of OpenClipArt.